Do you sit out in the back room of your salon with your scissors cutting up foils for your next customer? Or do you employ an assistant or student to do it for you? What a waste of time and money! Why not try our new product. You can have it next to you while you work on your customer, tearing sheets off as you need them. Now comes in 3 colors for when you apply different tints to the same hair. 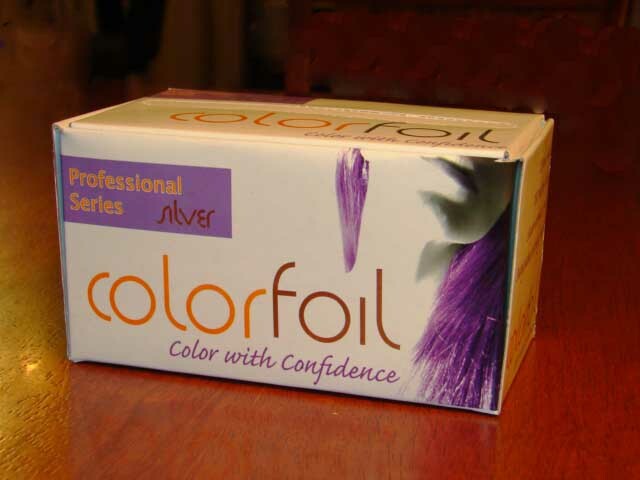 Introducing "colorfoil", now used by the hair-care industry. The handy dispenser pack is unique in so far as it has a perforated slot in the lid to make dispensing the foil a breeze - you will never lose the end of the roll again! If you need hair foils then try our product, you will wonder why you haven't always used it! It's much more competitively priced than the others and is now 20% wider. It eliminates waste, and saves time. It has a clever fold out cutting strip. Please contact us for your nearest distributor of colorfoils. It is currently stocked at a wide range of suppliers to the hairdressing industry.